As most people know, the Canadian fur trade was founded in large part on beaver pelts that were used for the making of felted beaver fur tophats in Great Britain. 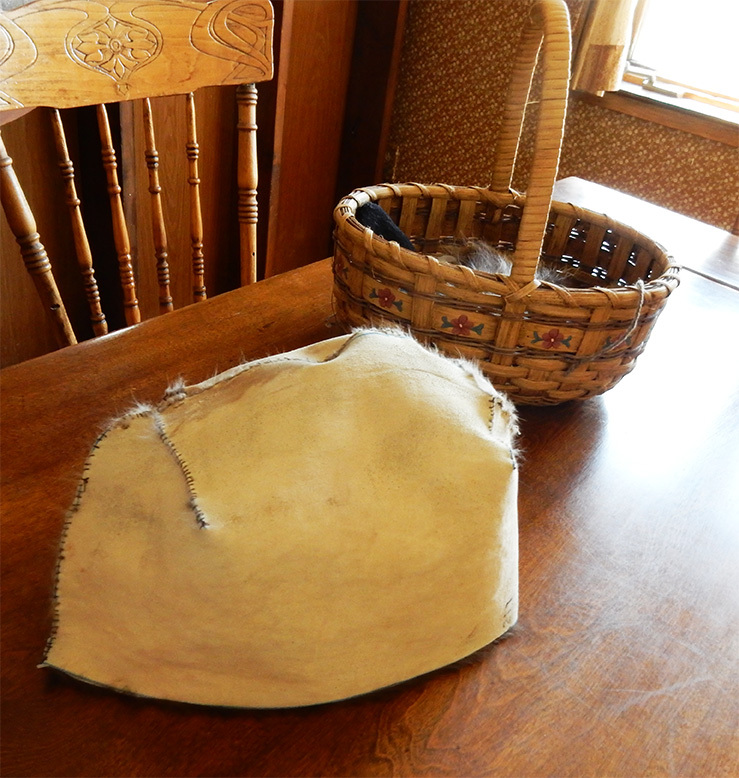 In keeping with the "Wear Our Heritage" theme, the making of a modern beaver hat is described here. In Canada, knit hapts, which are often called "stocking caps" in the U.S. are called toques. 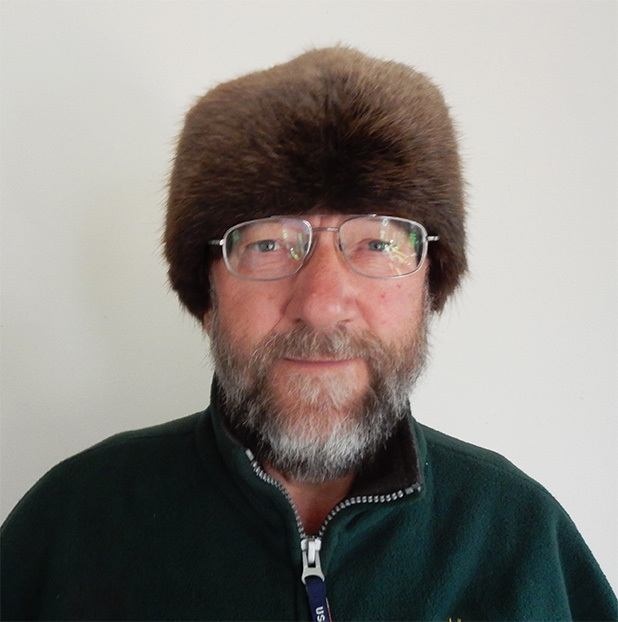 Therefore, this type of beaver hat is designed as a "BEAVER TOQUE". Beaver pelts are usually dried "in the round", or oval really. The tanned skins therefore are typically sold in that shape, although sometimes tanneries trim the underbelly fur away. For this hat, try to buy a relatively large oval pelt, especially if you are making a men's size large or extra large. First mend the leg holes in the pelt. 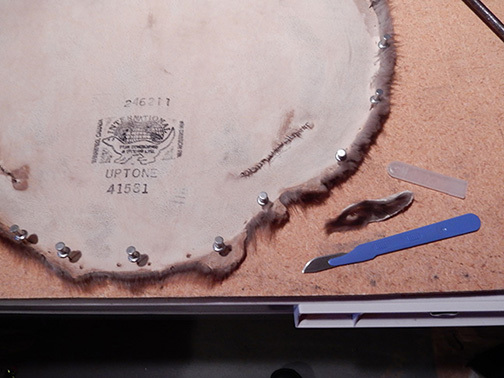 Often one has to cut out a small slice around the existing hold where the leather is turned out onto the former leg. This sliver of fur is laying near the pelt, that is shown with the holes stitched already. As with all fur sewing, one is meant to stretch the pelt before cutting it. 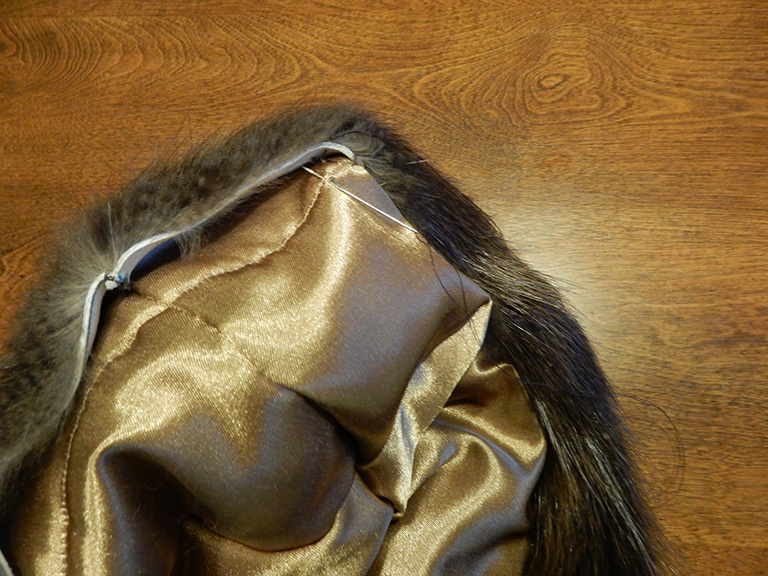 Stretching the tanned pelt can help to make a pelt that is a tad narrow accomodate the two pattern pieces. 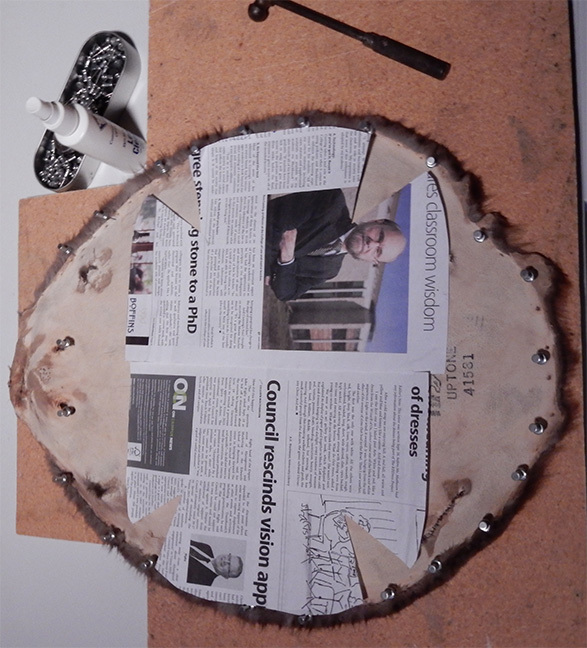 The pattern pieces were drawn on newspaper. The circumference needed is divided in two and that is the measurement for the straight edge at the bottom of each pattern piece. This one is 13 1/4 inches wide. Those straight edges are placed along the midline of the beaver pelt. The height of the crown is based on personal preference, allowing an inch to an inch and a half to turn under at the end. Given this is a Canadian style toque, my pattern pieces are quite deep (9 inches) so that the hat goes over the ears and sits quite low on the forehead. As you can see two rather large notches are removed at the front and back of the crown. Note that if you want to test the fit of your homemade pattern, you could make the hat liner first. 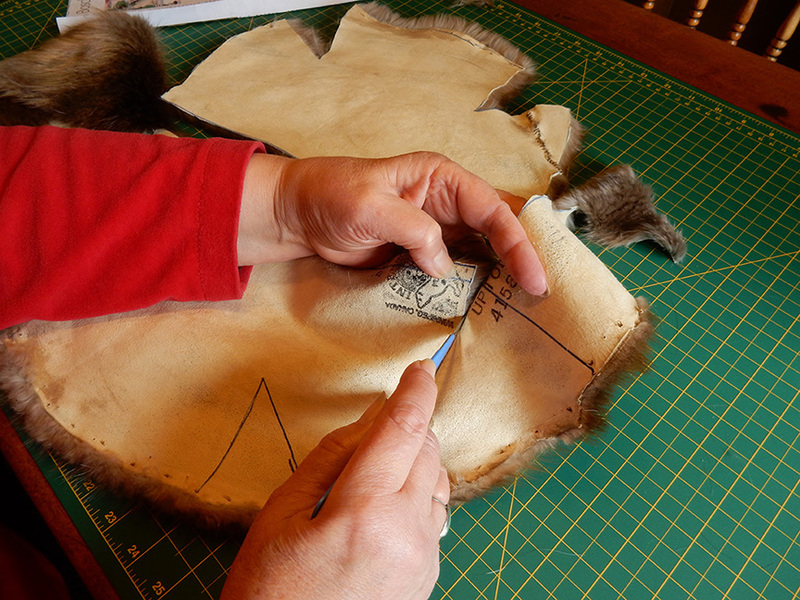 After marking the pattern pieces, in this case there are only two, one can cut the pelt. I am using a disposable surgical scalpel which is my chosen tool. Furrier knives are available. Safety edge razor blades would work although perhaps a bit tiny to use on a heavy pelt. Utility knives that have either changeable blades or break-off blades would probably also work. The important thing to do is to hold the pelt up off the table or surface and cut in mid air so that the blade is cutting through the leather but not clipping the hairs on the fur. One way to do this is shown below. Sewing beaver fur is too much for my fur sewing machine, a Bonis B. The gumminess of a beaver pelt seems to entrap my needle and bend it as I move the fur along and I break many needles that way. Most pelts also have quite thick leather, even after stretching, and the fur is dense so my machine also has trouble with stitching through that much depth. But hand stitching with just 4 notches and one long seam, doesn't take long. I did not keep track of the time, but was visiting with friends while I sewed and was finished within a couple hours. Use either a glover's needle or a relatively stout normal needle and a sturdy thread, such as hand quilting thread. Use stitches that are relatively close together. The hat is shown sewn together. The basket behind it gives one a sense of the size and proportion. The next step is to decide the type of lining desired. 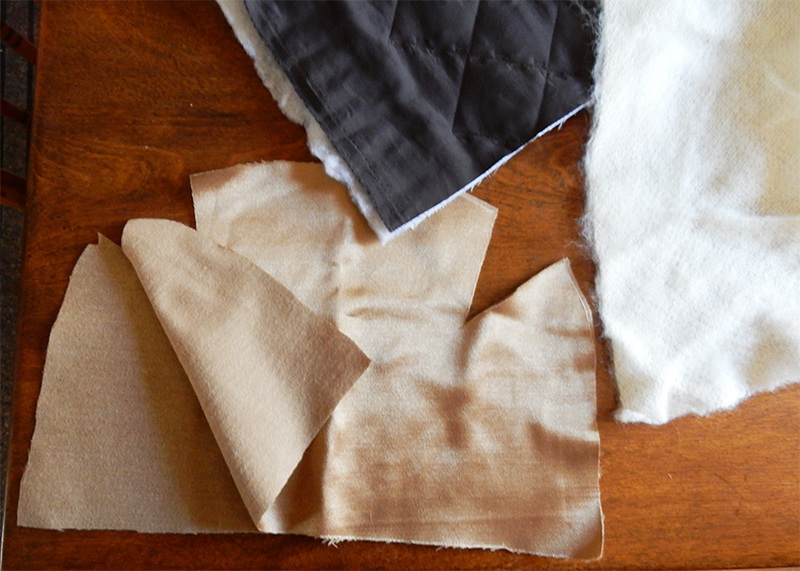 Many people use quilted lining for such a project. Usually there is some satin type lining fabric on one side and a thin layer of polyester fiberfill inside. The other side may have another type of fabric. One could also use a satin lining like kasha, which is cotton flannel backed satin. In that case adding a layer of soft wool interlining or very thin polyester would be beneficial. In part, decide whether to use that after trying the fur hat on the intended wearer. Be sure not to make the lining so thick that the hat would feel too tight. Cut out the lining fabric/s and use a normal sewing machine to make the inner "hat". If you used the same pattern pieces, use relatively narrow seam allowances, 1/2 to 3/8 inch. If you want the turned under fur to be outside the hat lining, then you could either cut off an amount of fabric from the lower edge of the hat lining equivalent to the amount you turn under, or turn it under. I used the fur on the outside because then the lining cushions the hat all the way to the lower edge. If you want the lining to be outside the fur, then cut off a bit less and turn under the fabric. But add a one inch strip of soft wool interlining or thin batting under the fur hem. Fur should have a "rolled" edge and not a "crisp" edge at a hem. In either case, slip stitch the fur and lining together. Your hat is now ready to be worn! Some people like to have the fur pointing towards the back and others have the fur pointing toward the front. Felting a Beaver Hat by Kelly Feinstein, History Department, University of Santa Cruz. March 2006.